I am delighted to announce that the book has been launched on Amazon Kindle. Thank you all for your great support! Click here for the book launch post and the latest news. It is a no-nonsense book for students, professionals, life-long learners, and everyone else who wants to improve their memory and learn powerful techniques to take notes and organize information from all kinds of sources. It merges classical learning and memory improvement techniques and modern computer tools in an effective way. Most traditional memory books focus exclusively on memorizing something. To this end, they introduce mental filing systems and a multitude of other mnemonics. For example, “Create a memory palace and store everything in your brain.” Yes – mnemonic techniques do work. They are fascinating. They allow a trained individual to memorize a deck of cards in the right order in less than one minute. They can also be of great help to pass exams and allow you to give an important speech completely from memory. Mnemonics are great – and used the right way, they can be a real time saver. Consequently, the most effective memory improvement techniques and mnemonics are covered in this book, and accompanied by easy-to-follow real-life examples. But, don’t believe anyone who says you will remember this information forever. You have to reinforce what you want to keep by reviewing it. And you have to be really smart about it if you don’t want to waste your time. This is where most books fall short. 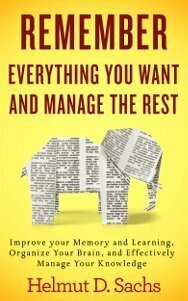 Many books merely scratch the surface when it comes to the most powerful memory technique of all – Reviewing what you have learned by practicing recall in an effective and efficient way. Besides, what is it that you want to remember in the first place? These days an enormous amount of information is stored on the Internet, your computer, your tablet, and your smart phone. In many subjects, there is more information than you would ever want to remember – and a lot of it will be outdated in a few years. So, you’d better not “download” it all into your brain. You’d better not even download most of it to your computer. You want to become smart about extracting the really important information and organizing what is relevant for your business, research, or studies, so that you can re-find it with ease while it is relevant. A comprehensive memory toolbox to allow you to learn and review faster and improve your memory in all areas of your life. The toolbox is really powerful – you will be amazed what you can do with your brain. You learn how to extract and organize information from all kinds of sources, including the web, e-books, documents, etc., using modern computer applications. Build your own digital library, re-find your documents with ease, and create bibliographies with the click of a few buttons. You learn how to best annotate electronic documents and how to take notes in innovative ways, including techniques such as mind mapping and outlining. A wealth of references and resources to allow you to read up on the research behind the techniques should you want to. 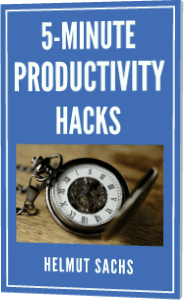 “Remember Everything You Wand and Manage the Rest” also introduces a set of powerful and mostly free software tools I have found effective and easy to use. If you like what you are reading, follow my blog by signing up in the upper right corner for free updates. Expect the book and a sample chapter to be out in early April. I will keep you posted on the details.